Friday’s heat wave caught everyone with their mouths open and their tongues hanging out. And that was just the dogs, but that’s what this column is about. At one point Long Beach reached 109 degrees—a temperature that shattered records and could have shattered thermometers. The Inland Empire fried at 118 degrees, and Death Valley, the point closest to Hell in the U.S., was at 124 degrees—nothing odd for that place, really, but those poor wild sheep dressed in wool! News and social media advise people to hydrate and find the coolest spots they can, and pets are included in these advisories. Please keep them inside or in shady areas and structures on your property. Provide them with plenty of fresh water, no matter where they are. Plenty of clean, cool drinking water is a must at all times to prevent dehydration. If your pet must stay in the yard instead of the cool indoors, be sure he or she has adequate shade and ventilation, with plenty of drinking water in a tip-proof bowl. If a pet is overcome by heat, which can be determined by excessive panting, heavy salivation or immobility, immerse him or her slowly in cool water to lower body temperature. Contact a veterinarian immediately—if your family vet is closed, contact an emergency veterinarian or one that keeps late hours (Long Beach Animal Hospital in East Long Beach is open until midnight every day, and Long Beach Animal Emergency, located near the Traffic Circle, is open around the clock daily, including holidays). Never immerse a pet in ice-cold water— it may cause shock. Clip long or matted coats to help your pet stay cool. However remember that pets, like people, can get sunburned, so coats should not be too short. Cats, especially, have “thermosensitive” fur that keeps them warm in cold weather and cools them off in hot weather. Carefully go over your pet’s body at least once a week to check for fleas, ear mites, and tiny bumps or cuts. Bring your pet to the vet for a summer check-up. Fleas need to be attacked on three fronts: on the pet, in the home and in the yard. Use a good flea and tick repellent recommended by your vet—don’t trust the over-the-counter types, and definitely don’t purchase them at a dollar store. Exercise pets in the morning or evening when it’s cooler. Be sure that you avoid hot surfaces like asphalt on hot days. You may want to get them some doggie booties to protect their little paddy-paws. 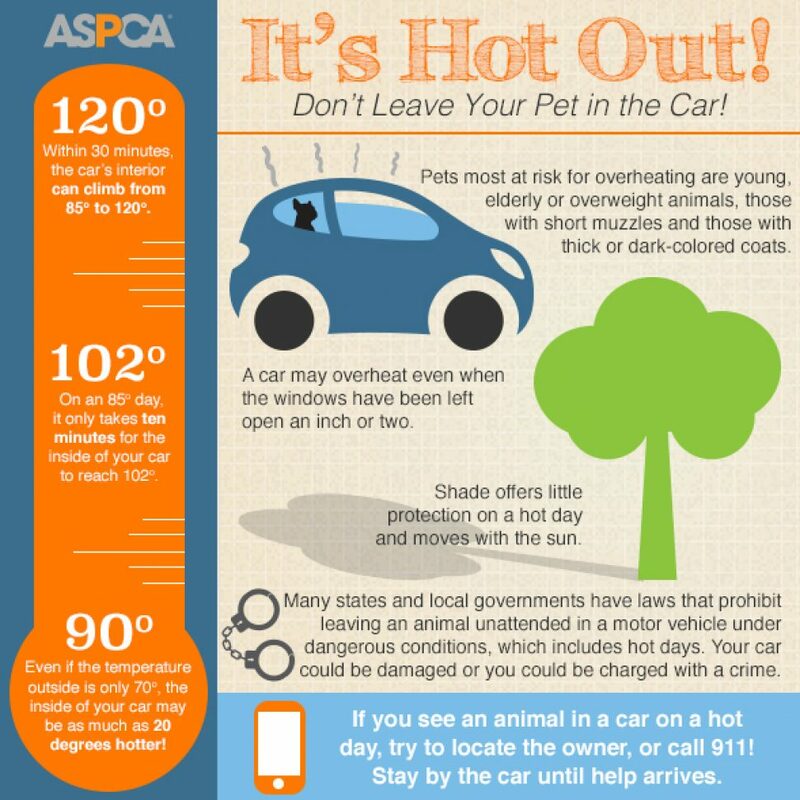 With the hotter weather, families and their pets are outside more often, increasing the chances of a pet getting lost. Make sure your pets always wear proper identification. Microchips are permanent, so get one installed. Fix Long Beach will give them out free this Saturday, July 14, at Ramona Park and at every monthly clinic. That couple of minutes can cost the life of your dog or cat. Even on cooler days, a car can heat up rapidly from the reflected light and can reach 160 degrees within minutes, says spcaLA. It isn’t the lack of air—it’s the heat. Graphic by ASPCA, not affiliated with spcaLA. Please—you love your pet, so if you can’t leave your dog or cat at home, take the animal with you when you leave your car. If you have a pet in a carrier, schlep it with you when you get out—it’s worth the extra effort. I did it once on my way back from the vet with a cat last summer when I couldn’t resist the Thacker Berry Farms stand. And some folks don’t know this, but there’s a law on the state’s books that allows police, firefighters, you, me or the pet lover down the street to break a window to rescue a pet in danger. California Penal Code 597.7 was amended and signed into law in 2016 by Gov. Jerry Brown through an assembly bill called the Right to Rescue Act. 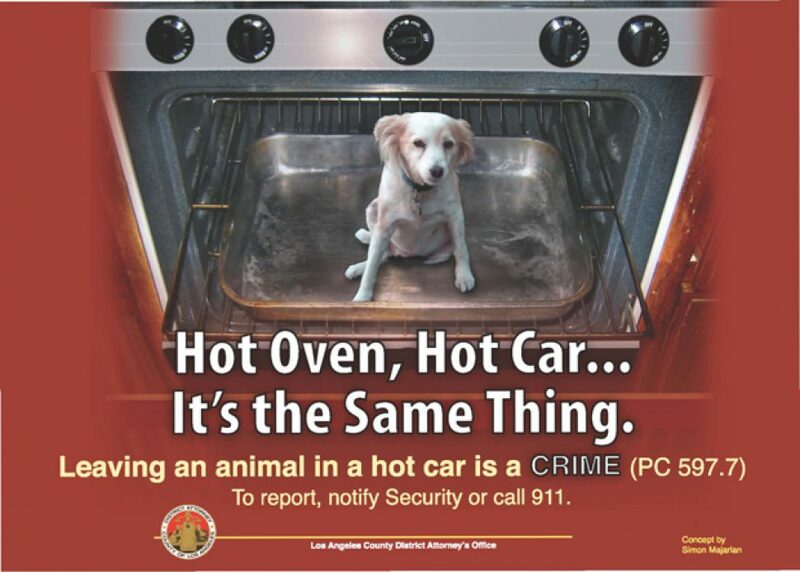 Make sure the vehicle is locked and there’s no other reasonable way to remove the animal from the vehicle. Reasonably believe that the animal is in imminent danger if not removed immediately from the vehicle. Use no more force to enter the vehicle than is necessary under the circumstance. Remain with the animal in a safe location out of the elements but reasonably close to the vehicle until a peace officer, humane officer, animal control officer or another emergency responder arrives. In accordance with the Right to Rescue Act, citizens are protected from criminal penalties when they act to free a pet in immediate danger from a locked vehicle, if they act within the law. Once the animal is freed, you must hand it over to law enforcement or animal control. Is the dog in distress, or just locked in a car? Is the dog OK, or is he or she exhibiting signs of distress as described in the first section of the article? Take into consideration interior color of car, whether in shade, time of day, and condition of animal. It has been suggested that if you are going to take action and break a window, protect yourself by taking a screenshot of current temperature and photos/video of act to protect yourself. If you are going to free an animal from a locked car, do you have a method of containing the animal, e.g., a leash, a collar or a carrier? The animal will likely be scared and could bolt into oncoming traffic. Use an abundance of caution in approaching a pet in a vehicle! You are a stranger entering his or her territory! Stay cool, all of you. These cards were created by L.A. Deputy District Attorney Deborah Knaan’s office as part of a 2009 public-education campaign. They are available free at Long Beach Animal Care Services, 7700 E. Spring St., Long Beach, at the entrance to El Dorado Park. No parking fee for shelter guests. ~ Arguably and probably erroneously attributed to Dr. Martin Luther King Jr., but certainly of worth to all of us.